How can I format my external APFS disk? I formatted my external backup disk as APFS pretty easily recently. Just used the Disk Utility as per normal. But I discovered very quickly that while Time Machine could read from APFS it could not write to it. Maybe in the future but not now – 10/15/17 – not. So I thought to reformat it a it as Mac OS Extended (Journaled) which I know works with TM. But when I tried the only choices were different APFS ones. So what to do? The solution is – from what I can tell – the following steps. I would not be surprised if there was other choices. Toggle under the View option to see All Devices – by default it only shows volumes. Now you will be able to select the parent of your APFS formatted device. 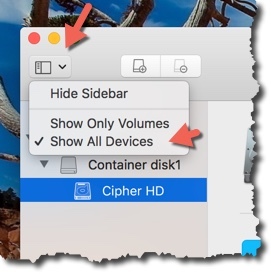 Don’t click on the APFS volume, but the option above it. When you use the Erase button with the parent you will have the traditional choices and you will be able to select Mac OS Extended (Journaled) and get your external drive working with Time Machine again. Questions or comments always welcome.